Brand New House. Move in Ready!! Corner LOT!!! 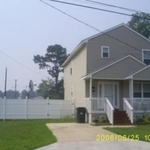 3br, 2.5 baths, Living Room, Dining Room, VERY LARGE SPACIOUS Kitchen (GOT TO SEE). Central A/C & Electric Heat. NO Gas. Security System, ALL appliances included w/Washer & Dryer Hookups!! Park Like Backyard w/Storage Shed. Privacy Fence (14FT). Quiet Neighborhood. Need More Info call 757-580-0110.